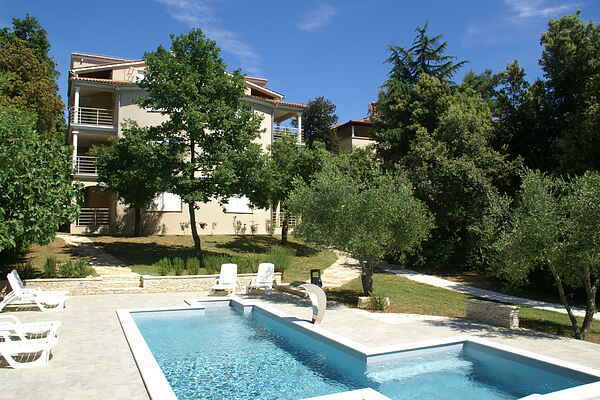 A wonderful holiday close to the beach and the city while still enjoying the peace and quiet at home by the pool? It's all possible! You will stay in a comfortable apartment, 300 meters from the beach of Banjole! The 14 apartments in the complex have been tastefully furnished. Living room with lazy lounge area, dining corner and access to the balcony with a view. In the shared garden you will find the swimming pool with sunbeds and an outdoor shower. There is a BBQ and some playground equipment for the kids. In the complex basement you will find a small gym. You can have a snack and a drink at one of the restaurants of the domain. Tennis court and groceries at 800 m. Restaurant and bicycle rental at 20 m. There is so much to see in the area! Pula (8 km) is definitely worth a visit. This is a place where you can still truly enjoy a Roman atmosphere. In particular the impressive amphitheater that is still intact and one of the biggest in the world, reminds you of the far old times. Other fun days out should include the historic towns of Rovinj (43 km) and Porec (51 km) with its beautiful Byzantine Euphrasian basilica. Or catch a boat from Fazana (16 km) to the protected Brijuni Islands.